SKIP THE GOGGLES BUT DO BRING YOUR CAMERA! 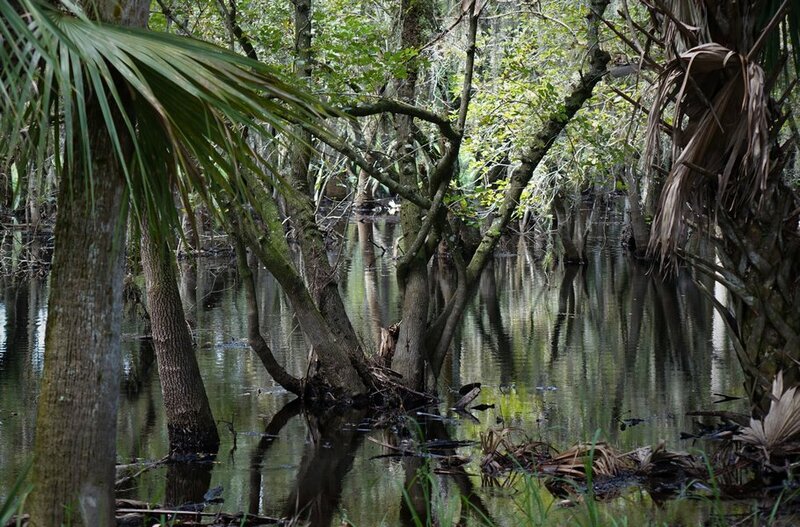 Since the water level of the Myakka River has been slowly going down to what I THOUGHT was below flood stage, I figured the trails would pretty much be open. Instead the river was still emptying into the woods to the point where a current was readily visible. Wet walks into this section of the woods would not be high on my list since this is the trail where I generally see many of the BIG GUYS of Myakka. I would glady cede this domain to them when the river has so overtaken the woods that they'd have no problem paddling their way among the trees to see what I might be doing. In fact this guy popped up from the bottom of the river near where the river was flowing into the woods. Since this trail was too water-logged, I next hit the main road of the park to see whether the "swamp-look" to the woods was still around. 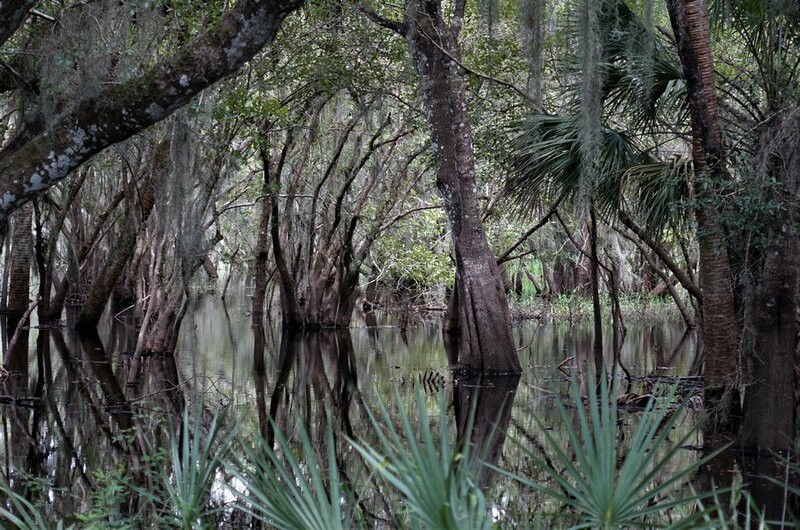 Although some woods were drier than they had been, many were still presenting as a mysterious water-filled wilderness. Generally I don't see any alligators here during the times when I'm at the park but I often wonder whether they cruise these "waters" as well. 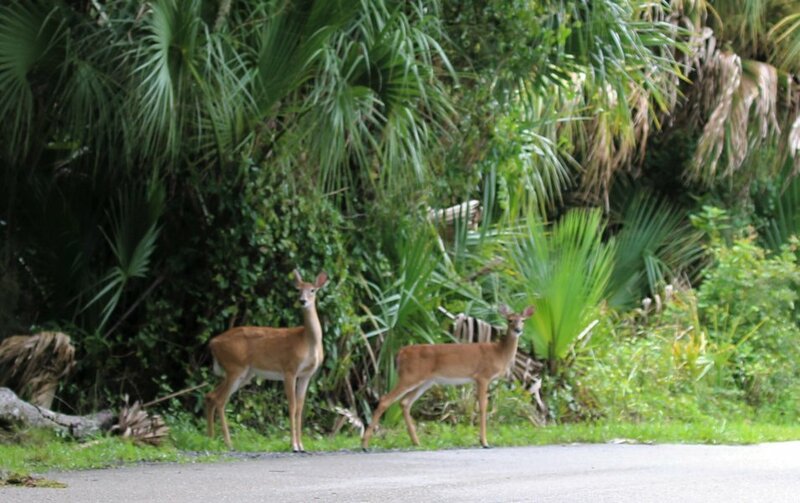 When the Myakka River lays claim to the park, they certainly have speedier ways to move from Point A to Point B. Whether they cruise the river, the forested "lakes," or the "pond-like" fields, the world is indeed their oyster as their options seem to be everywhere. I'm not sure how well the BIG GUYS can maneuver in the fields though. I don't imagine the water is over a foot here but if they did come a'calling, what a sight they would see.... scenery to enjoy. The Upper Lake is another story. Here they would have more room to roam freely. 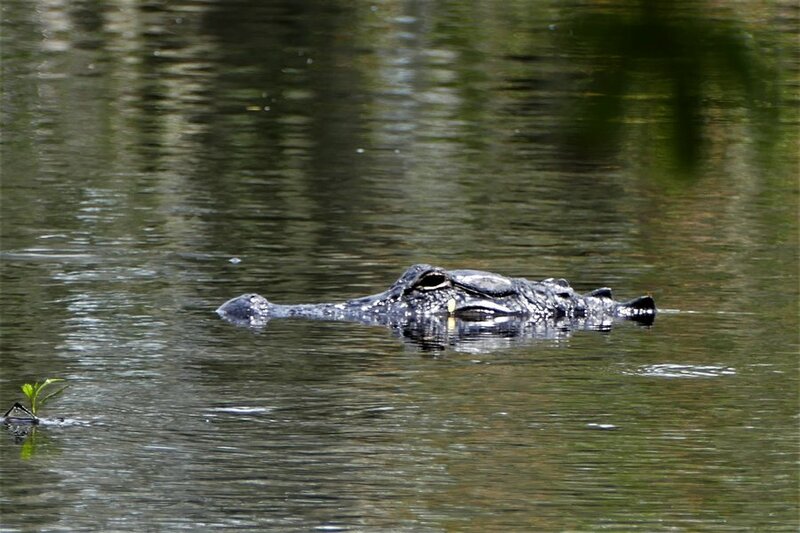 As I was heading down to the Bird Walk, one alligator, however, was not taking advantage of his new deeper waters. Instead he was patiently waiting...facing where the culvert emptied into the lake and possibly conducting many unsuspecting delicacies as well. As I stood on the road taking my pictures, I hoped that he didn't mind my interfering with his lunch. I did watch his front legs to see if they might be getting tensed but no doubt if they were, it would have happened too quickly for me to have it registered. As it was, he did what alligators always seem to do. He waited and waited and waited. At another place, I happened upon another patient alligator...one who seemed to be watching one of the birds who had been "fishing" in the flooded field. Upon closer inspection, the "alligator" was just a submerged tree limb. Sometimes what you think is there is NOT there but sometimes it is. That's what happened when I first glanced at a tree beside the road. The bird who was resting on its trunk was so blended with the trunk that he was not readily visible to those driving down the road. In fact I had to vary my position to get a clearer shot. As I watched him favor his one leg, I wondered how long he had been standing in this same spot. 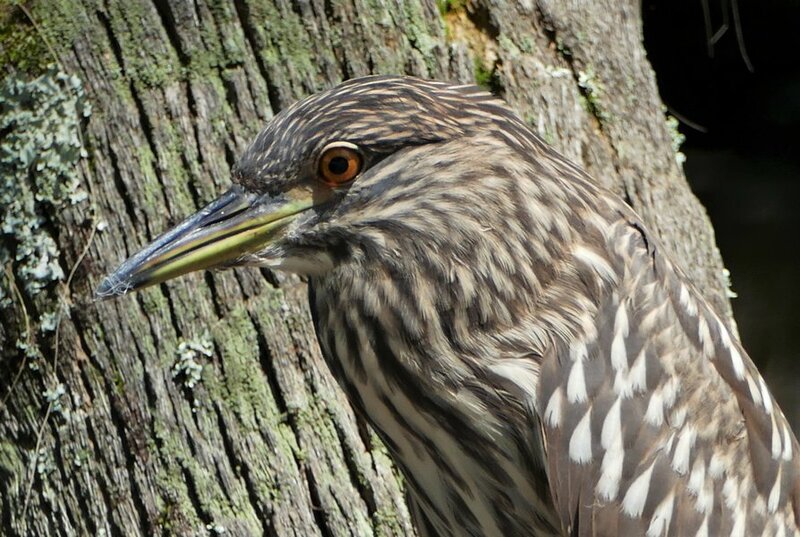 For birds who generally hunt in the woods or fields, the water-logged conditions of the park must make for one exhausting day as they perch on a side of a tree watching the world go by and waiting for the waters to finally recede. 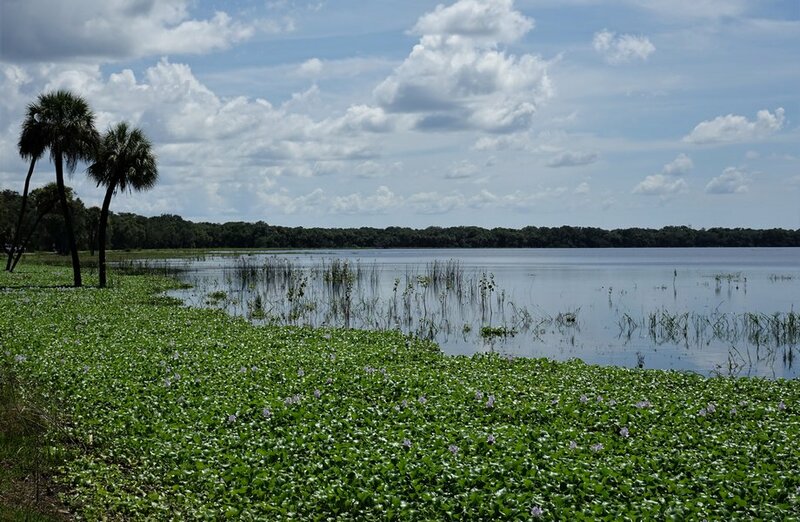 Should you ever want to know the water conditions at Myakka River State Park, here's a handy site that will tell you what the level of the Myakka River is and what impact that level will have on the various sections of the park. I think the park is pretty in any stage. If you have the time, maybe you might think so too. 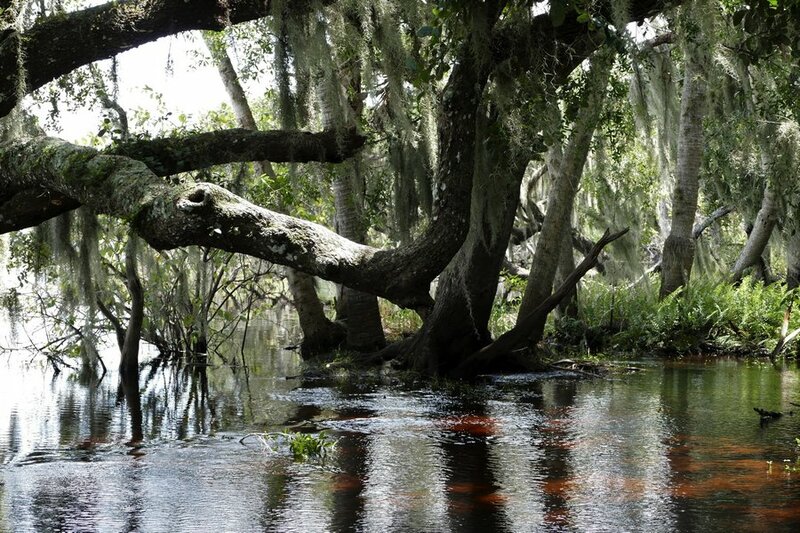 When flood alerts go out for Myakka River State Park, it's opportunity time. 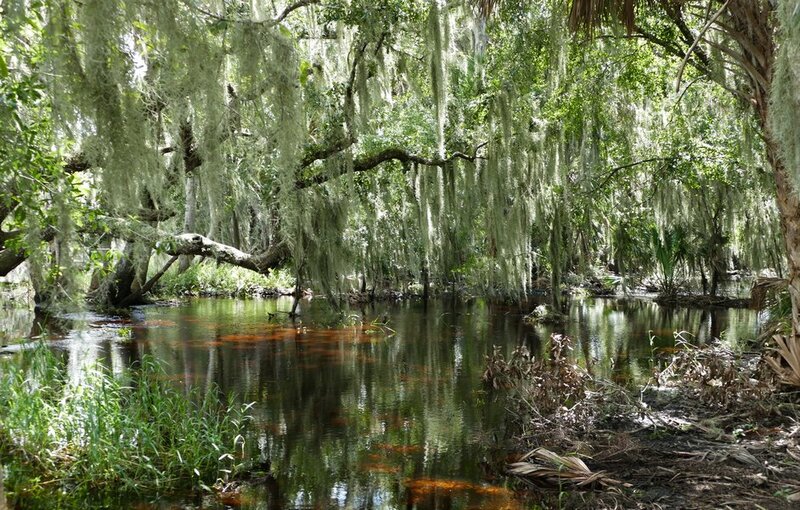 Favorite trails are just as pretty underwater as they are when the waters have receded, but you do have to be aware of where the alligators might be taking a nap. Flood alerts are also an opportunity to make new friends. Birds who normally might be hiding in the trees or in the brush are now more visible along the roads. While families that used to stay hidden in the woods are now coming out to say "Hey!" Flood alerts even give vultures an opportunity to pursue a healthier diet plan as they are forced to abstain from munching on all the tantalizing windshield wipers too tempting to resist. How long the park stays accessible remains to be seen. The river is expected to continue rising and Monday through Wednesday should make for additional changes in the park. As of 7:00 PMSunday the river stage was 8.18 feet. When we were in the park Sunday afternoon, the flood waters were approaching the road, but they hadn't yet overtaken the road that leads to the restaurant and stores. 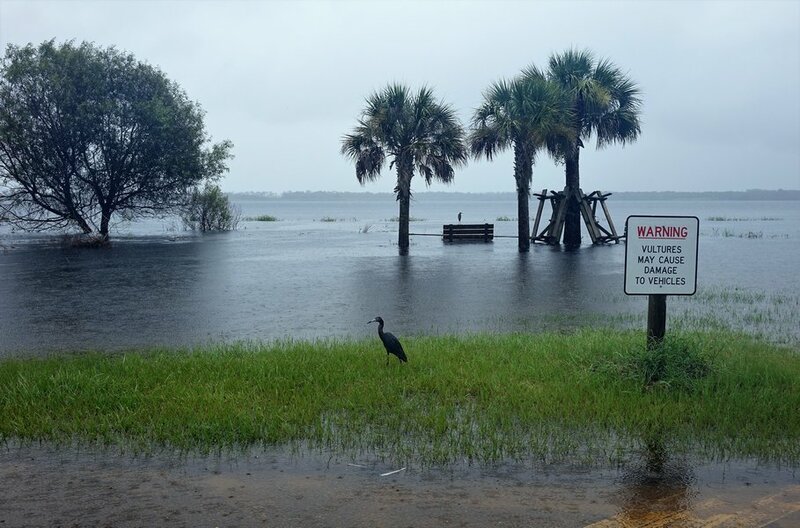 However, the section of the road that goes to the birdwalk was flooded and closed to vehicular traffic. FYI: Trails, picnic areas and parking lots flood at 7 feet. The main road at the park floods at 8 feet. At 8.5 most of the park is closed to vehicular traffic. If you decide to go, wear water shoes, bring your cameras and BE CAREFUL!